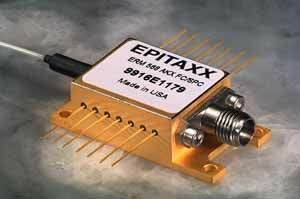 EPITAXX, Inc and ERM 578 10 Gb/s InGaAs PIN and Avalanche Photodiode receivers are fiberoptics receivers targeting the emerging 10 Gb/s transmission needs of network operators. The platform, based on PIN and Avalanche photodiode (APDs) detectors, supports both short and long-haul receivers for OC-192/ STM-64 and DWDM applications. The APD receiver incorporates a low dark current, low capacitance detector and a low noise front-end electronic amplification stage. These devices offer a minimum bandwidth of 8 GHz, a high return loss for improved matching, and a high gain for lower noise performance. Packaging options include either a K-connector configuration for easy testing or a differential strip line output for volume assembly. Because both short and long-haul receivers are integrated in identical packages and are pin compatible, they offer the high-speed electronics designer additional board design flexibility.